From mistletoe to ornaments and decorations to toxic plants and poisonous foods, danger is lurking around nearly every corner for your dog throughout the holidays. 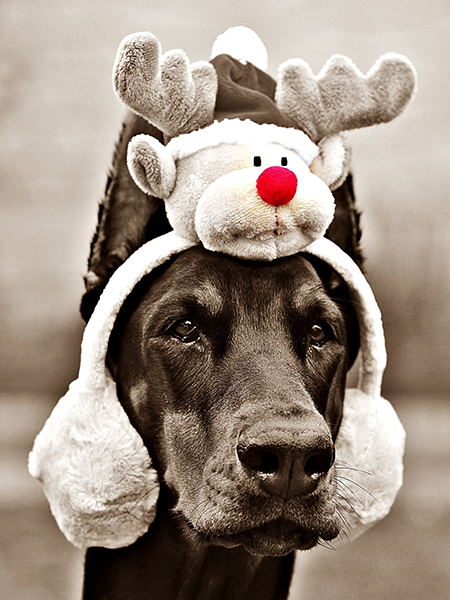 Keep your pooch safe all season long by following these holiday safety tips for pets! Your Christmas tree should be against a wall or in a corner, as opposed to in the middle of the room. Make sure when you set it up that it’s as secure as possible so it can’t easily be tipped over. If you have a real tree in the house, keep it watered and keep the water fresh so it doesn’t become a breeding ground for bacteria. If your dog ends up drinking the dirty water at the base of your tree, he could get sick. If possible, especially if you have a curious dog or puppy, block off the area surrounding the tree to prevent accidents. Tree decorations should be kept out of your pet’s reach. 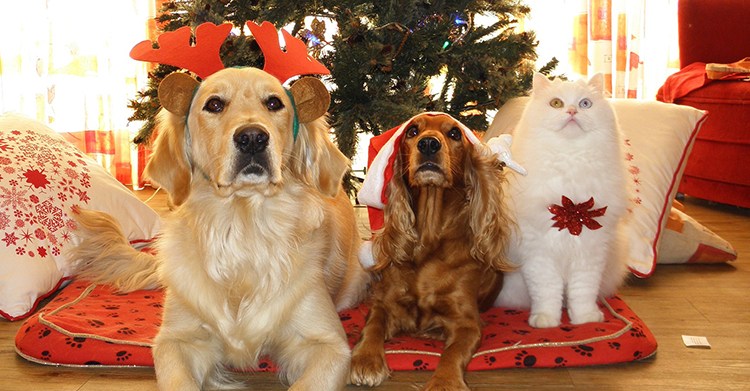 If your dog or cat swallows tinsel, for instance, it can block her intestines and may require surgery to remove. Low hanging lights could be tempting for your pet to play with or bite, which could result in entanglement, shocking, or even fire. Animals can also choke on other ornaments or be cut on broken glass. If you have a real tree, keep the pine needles cleaned up so your pet doesn’t eat them; pine needles can puncture an animal’s intestines. These two plants may be fun for you, but not so much for your dog! If your pet ingests holly, he may end up with nausea and/or diarrhea. If mistletoe is ingested, a dog could end up with an upset stomach and experience cardiovascular problems. Keep all plants in your house up and away from your pets, and consider swapping real holly and mistletoe for plastic or silk alternatives. Do not feed your dog leftover bones or meat. (Click here for a few possible exceptions.) Never give a dog caffeine or alcohol. Keep chocolates, artificial sweeteners, and sweets in general away from pets. For a list of foods to keep away from your pets, check out Thanksgiving Foods That Are Toxic for Dogs & Cats. Keep any open flames far away from any pets in the house (and children, for that matter). Don’t leave a lit candle in a room unattended. Depending on your dog’s personality and how well you have him trained, he may or may not be okay around visitors. Some dogs are more aggressive to strangers, some are timid, and others get really excited and will jump up on guests to say hello as soon as they walk through the door. Keep your dog’s normal behavior around strangers in mind, and act accordingly. You may need to block your dog off in another room or behind a gate to keep him away from guests. Most people wouldn’t like having a dog jump all over them as soon as they enter your home. Learn how to keep your dog from jumping up on people by checking out this blog post: Dog jumping up on people? Why “OFF” & turning your back doesn’t work. Also be sure to check out this great article about dogs and the holidays: Christmas Party + Your Dog’s Bad Behavior Stressing You Out? 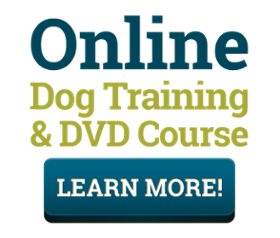 Looking for the best online dog training program out there? Look no further. Sure, we’re a little biased, but we’ve seen many great results from this program and want you to try it yourself to see how it can transform your dog’s behavior! Sean McDaniel uses methods that make sense and show results. Build your relationship with your dog as the two of you work through The Dog’s Way training program together!